The Homeland Union – Lithuanian Christian Democrat Party union Lithuanian Christian Democrats published a declaration regarding the situation in the party on 29 November. The Christian Democrats are concerned that the current situation in the party raises worries on the survival of the party and is “important to both the party and the state”. Meanwhile the TS-LKD Chairman Gabrielius Landsbergis calls such a declaration “an expression of party members’ opinions”. The Christian Democrat wing of the Conservative party let loose after a recent weekend council meeting of the TS-LKD. “The survival and strengthening of our party is important not only to the party itself, but also to our state. Nevertheless we see that this survival is threatened. To remove the threat, an honest analysis of the lost 2016 elections is needed, as well as answering what are we prepared to be and what voters we intend to represent in the future. 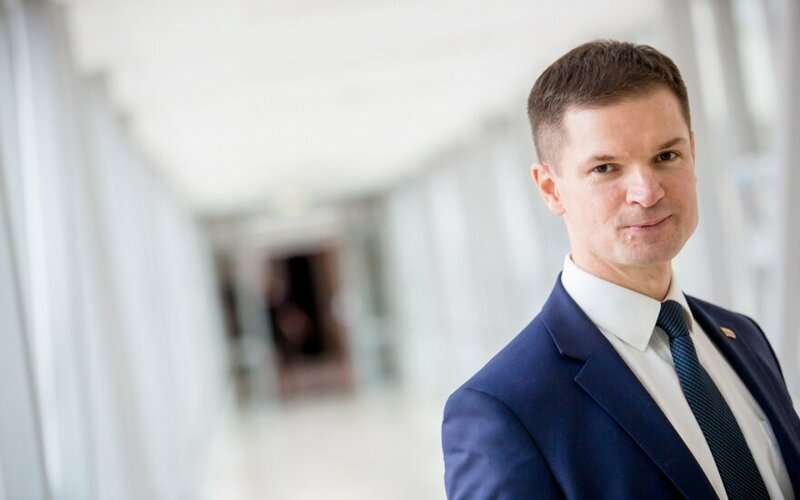 We should already realise what avoiding analysis of election results leads to – unwillingness to openly discuss the unsuccessful 2015 municipal election results had an influence on the poor performance seen in Kaunas during this Seimas election,” states the declaration. It is signed by the LKD Union chairman, former member of Seimas Valentinas Stundys. P. Saudargas and other Christian Democrats view the forsaking of its identity as the main mistake of the TS-LKD. “Without going into a detailed discussion of the mistakes which made for a painful election result, it is necessary to admit that the main mistake made was forsaking its identity. The TS-LKD political activity programme clearly identifies such goals as unifying the nation and strengthening democracy in Lithuania based on classical virtue tradition, as well as safeguarding and nurturing Lithuanian cultural values. These goals are horizontal and thus should be reflected in all our activities and election campaigns, but declarations in this election and individual work done raise doubt on commitment to these goals,” states the letter to party members. According to party members, at the start of the elections the Christian Democrats did not direct attention to this dissonance between party programme and campaign rhetoric. “Corruption scandals among political opponents and the TS-LKD’s targeted work with primarily only youth made for short term results in the first round of elections. In the second round when the alternative voters are most important, the youth vote did not suffice any longer, while doubts on our value positions or even avoiding to openly talk about base Christian values pushed a part of the electorate toward the Peasant Greens,” the Christian Democrats believe. The party members did not spare G. Landsbergis of strong criticism for “pandering to the Liberals”. Apparently by pandering to the supposed liberal voters, forgetting the causes of social sensitivity, the Conservatives “completely failed to use the 2012-2016 accomplishments regarding the new Labour Code and retirement pensions. We allowed ourselves to get lost in voting for questions of life, to leave ambiguity in our view of family questions, while the Peasant Greens employed Christian ideas and people chose them. We lost that rare opportunity to earn a wider than usual trust from the people”. “Pandering to the Liberals is becoming disreputable even after the elections, an impression arises that we are inadequate without them. A constant effort to be friends even when there is no justification for it is beginning to look unnatural and hurts the eyes. The problem is further highlighted when the Liberals chose to become the clearest opposition force and strongly distance themselves from the Conservatives’ friendship. The TS-LKD is unfortunately acting as if it would not understand that, it does not even attempt to defend its identity and the clear TS-LKD and Liberal value differences. Such a position threatens the future of the party,” said member of Seimas P. Saudargas. The members of the Christian Democrat Union urge their TS-LKD colleagues “to answer the question, who other than ourselves, will need us after 4 years”. They see not only internal, but also external threats in this regard. “On one hand in the economic right we have the Liberals, who clearly feel right at home. On the other side – the more Conservative TS-LKD trajectory is limited by the Peasant Greens, who more and more entrench themselves in our former position – defending traditional values. It is a very risky situation. With the traditional TS-LKD electorate turning away, it is crucial to choose, who we want to represent and no less important who in Lithuania wants to be represented by us. Whether we look toward more liberal or more conservative voters depends on this,” states the declaration. “Most of the Lithuanian people long for traditional values and do not feel represented, this trend is reflected in the change of the people’s views in the world. The TS-LKD must not only reaffirm the historical continuity of its identity, but also to consistently base its political activities based on those premises,” P. Saudargas notes. The politician denies that such a declaration is a challenge, slap in the face or demarche to the party or its leader G. Landsbergis. He also assures that this declaration should not be held as a signal that the current TS-LKD management is not upholding the provisions and theses of the 2008 two party merger. “There should be no such allusions. We are only reminding that we are a merged party with a common programme and that the Christian values we represent are neither adequately represented, nor adequately defended. Thus this declaration is a reminder of what we want to say and what we seek from the continued functioning of the party and the direction of its programme,” said P. Saudargas. Meanwhile the Chairman of TS-LKD G. Landsbergis says that he views such a declaration from a part of the party as proof that the party is open and willing to discuss, but says that if he receives the trust of his fellow members, he would continue the party’s renewal. “I personally intend to continue the party’s renewal, to increase our community’s openness to society and a vision based on moderate and sensitive conservatism. Something akin to that of A. Merkel’s Christian Democrat Party in Germany, where all party members can find their place – from more liberal conservative representatives, youth and urban professionals, to political prisoners and exiles, Christian democrats and renewed nationalists,” said the TS-LKD party leader. According to Landsbergis, the council meeting on Saturday (November 26) had a discussion where the Christian Democrat Union representatives presented their views, but there were cardinally different opinions from other members of the council. “There are various opinions in the party, other party members had a radically different understanding, stating that we have to value the strong trust presented by the young generation and not push it aside. I, however, value and respect the broad and varied, often filled with differing perspectives, discussion. I believe that openness to discussion, difference of opinion and democracy is our party’s unique point and strength,” said the politician. When asked if he is not surprised that such a declaration from the Christian Democrats matched with the just started Advent period, which is related with repentance, purification and renewal in Christianity, G. Landsbergis assured that he wishes everyone “harmony and concord”, while also linking it more with the future party chairman elections. “I believe various candidates will present their different visions of the future for the party during the party chairman elections and our fellow members, all of them, will choose the one they find most acceptable,” stated Landsbergis. Delfi reminds that the current Homeland Union – Lithuanian Christian Democrats rose up from a 2008 merger of the Homeland Union (TS), then led by Andrius Kubilius and the Lithuanian Christian Democrats (LKD), then led by Valentinas Stundys. With the 14 thousand member strong TS and 4.5 thousand strong LKD merging, it was then the most numerous party in Lithuania. The leadership of TS-LKD went to A. Kubilius, his first deputy would be Christian Democrat V. Stundys, other deputies – Irena Degutienė, Povilas Jakučionis, Rasa Juknevičienė and Paulius Saudargas.